[SYDNEY] YOUNG, John after Gilbert STUART. London: n.d., circa 1790. Mezzotint engraving, 440 x 310 mm; framed. A fine and fresh impression: Lord Sydney, after the official portrait by Gilbert Stuart, the celebrated American portraitist - the "father of American portraiture" - who worked in England from 1775 until the late 1780s. A protégé of Benjamin West, with whom he studied for six years, he reached such success in England that at one point only Reynolds and Gainsborough were getting higher prices.Viscount Sydney was of course instrumental in promoting the idea that a penal colony be formed in New South Wales. As Secretary for the Home Department when the decision was finally made to colonise New South Wales, he was the first to announce, in August 1786, George III's decision to send out the First Fleet. When Arthur Phillip finally decided to establish the settlement at Port Jackson, rather than Botany Bay, he paid the Home Secretary the compliment of naming Sydney after him, now one of the great cities of the world. TENCH, Captain Watkin, and George PATTERSON. Voyages dans le pays des Hottentots... à la Baye Botanique, et dans la Nouvelle Hollande. Traduits de l'Anglois, accompagnés de détails précieux relatifs à M. de la Pérouse. Paris: Letellier, 1790. Octavo; contemporary French marbled sheep. The second, considerably changed, Letellier version of Tench's account. Letellier had also published a version in 1789: it is not clear whether his edition or that published by Knapen the same year was the first French account of the new colony of New South Wales to appear in print.In this edition the publisher provides Tench's account the first eye-witness account of Australia's settlement - along with the account of La Pérouse at Botany Bay, together with the substantial addition of Patterson's narrative of travels in South Africa. Front cover marked but a very good copy. London: M. Smith (pseudonym of George Kearsley), 1790. Octavo, with half-title and frontispiece; in rubbed contemporary half calf with a gilt ruled and lettered crimson label. An attractive copy of the partially reprinted Barrington memoirs (here spruiked as 'A new edition, Greatly improved') issued by London bookseller George Kearsley under the pseudonym 'M. Smith'.Transported to New South Wales on the Third Fleet of 1791, Barrington was already a legendary hero in EngIand, a prince of rogues. The English public's continuing interest in New South Wales and the fate of the transported convicts encouraged the publishers' greed: they compiled information from various sources to satisfy a public starved of accounts of the new colony since the books by Tench and Hunter in 1793.Unlike other known examples, this copy has a half-title page preceding the frontispiece leaf. It is bound with another Kearsley criminal biography An Authentic Account of the Forgeries and Frauds of... Charles Price (1786). Kearsley's late eighteenth-century novelised crime biographies were an important step in the development of the 'true crime' genre that became developed into a mainstay of nineteenth-century English publishing. The Price biography portrays the famous forger as a shameless wheedler who had the audacity to suicide rather than face his destiny on the gallows. A little offsetting affects the title-page, occasional light foxing yet, a very good copy. Paris, chez Letellier, 1790, in 8°, de 3ff. 213pp., - & paginé de V à VIII (sans le titre et le fx-titre de la 2e partie, comme souvent) 266pp., le tout rel. en 1 vol. pl. basane racinée époque, dos lisse entièrement orné, qq. taches et restauration en marge du feuillet de titre. (ex-libris gravé XIXe "Bibliothèque du château de Paulhac", propriété du Marquis Anatole de Cassagnes de Beaufort de Miramon, 1828-1912) Edition originale de la traduction française de Théophile Mandar de la relation du botaniste britannique le Colonel Paterson en Afrique du Sud, avec une intéressante description de la faune et de la flore, des plantes et animaux venimeux, des coutumes des Boers, Hottentots et Bushmen qui habitent les zones côtières ... Suivi de la traduction de l'ouvrage du capitaine Tench, embarqué comme volontaire en 1787 à bord du navire la "Charlotte" qui transportait des prisonniers pour "Botany Bay" en Australie. Il consacra une grande partie de son temps à explorer la Nouvelle Galles du Sud, et découvrit la Nepean River. Il livre ici un témoignage fondamental sur les premiers mois de la colonie pénitentiaire en Australie, le pays, les ressources, les autochtones, les colons, etc. Tench fut l'un des derniers capitaines à voir La Pérouse et ses vaisseaux qu'il croisa à Port Jackson. ¶ Gay, 3111 - Ferguson 96 - Boucher de la Richarderie IV, 241. Flora Cochinchinensis: sistens plantas in regno Cochinchina nascentes. Quirus accedunt aliae observatae in Sinensi Imperio, Africa orientali, Indiaquae variis. Omnes dispositae secundum systema sexuale Linnaeanum. 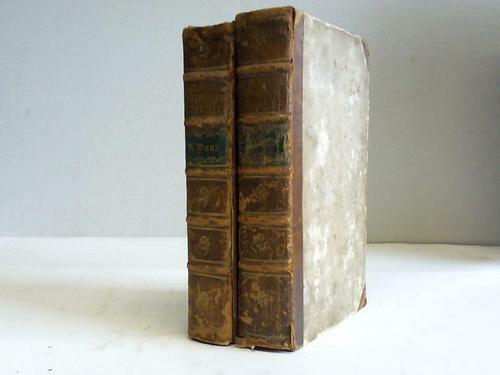 Ulyssipone: Typis et Expensis Academicis, 1790.- 2 vols. [(2), XIX, (2), 353; (4), 744, (4) ]p.; 28cm.-CRara 1ª edição desta obra cientifica muito apreciada. João de Loureiro (1715-1796) foi um dos nossos mais importantes botânicos, e devotou o seu trabalho ao estudo da flora do Sudoeste asiático onde recolheu um notável herbário composto por mais de mil espécies. Assim, esta Flora que segue já a nomenclatura Lineana é uma das mais importantes contribuições àcerca da flora da parte leste da peninsula trans-gangetica e do Sul da China. Obra com interesse sistemático.Cartonagens recentes ao gosto antigo em papel marmoreado com rótulos em pele. Primeiras e ultimas folhas com leves picos de acidez devido á qualidade do papel. Staffordshire: Wedgwood, circa, 1790. Ceramic creamware jug with world map printed on two sides, stands 186mm tall with a diameter of 90mm; spout has been abraded, small hairline crack to the rim, generally in very good condition. Charming late 18th-century Wedgwood printed jug displaying a world map which includes recent discoveries in the Pacific and east coast of Australia. The jug was clearly produced after the third voyage of Captain Cook as the Hawaiian islands are marked on the map, which features Australia divided into New Holland and New South Wales, the latter still connected to Van Diemen's Land. 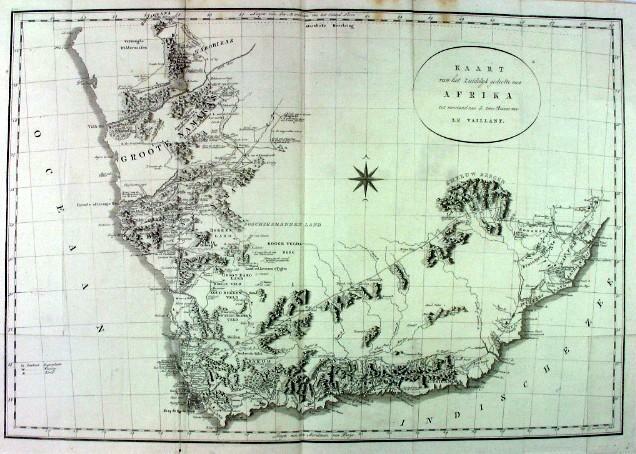 An imaginary southern land is partially depicted as an incomplete island named 'Terra Australis' southwest of the Cape of Good Hope and directly south of Tristan de Cunha. New Zealand is depicted with the Cook Strait clearly marked, as are many of the smaller Polynesian groups such as Tahiti and the Solomon Islands. Both hemispheres of the world are adorned with allegorical neoclassical figures in dramatic poses including a New World Indian in the southern hemisphere, an African figure with resting lion and an Oriental maiden flanked by a camel.Wedgwood creamware was produced in Staffordshire from the mid-eighteenth century onwards and after slow acceptance by the market eventually became a huge commercial success for the firm. The map is a double-hemisphere type in a style typical of the end of the century as exemplified by Samuel Dunn's world map of 1787 or the map engraved by James Lumsden in 1785. This rare Wedgwood jug reflects the curiosity of late eighteenth-century Europeans for voyages of discovery at a time when the last remaining geographical mysteries were finally being resolved. It is a delightful record of contemporary discoveries in the Pacific and on the east coast of Australia. Bath: Printed by S. Hazard, for G. Riley, London, 1790. Square 16mo, with an engraved frontispiece, two engraved plates, four full-page woodcuts in the text and altogether 48 circular woodcut vignettes; in a simple contemporary sheep-leather binding, unlettered spine banded in gilt. The extremely rare first edition of the earliest educational work to refer to settled Australia, including (p. 181 onwards) a seven-page description of Botany Bay, 'being now a part of the world allotted for civilization'. Ferguson knew only the Mitchell Library's copy of this first edition, which was printed in Bath for the London stationer George Riley, and has the series-title for the Historical Pocket Library in which series this is designated the fifth title, devoted to Geography. The final two pages of Riley's advertisements in this edition show that he was chiefly a stationer rather than a bookseller; in fact the advertisement mentions no printed books at all.Ferguson also knew only the National Library's copy of the London-printed second edition of the same year, though we now know of three other copies. The London version was completely reset, with very different pagination, but used the same frontispiece (which has Riley's imprint and is dated 18 July 1789). It was printed for Riley in London but also sold by Hazard in Bath, as well as by Watson and Elder in Edinburgh.The State Library of South Australia featured their copy of the second edition of the book in their exhibition Australia on the map 1606-2006 (online resource, evidently no longer to be found online) noting that 'the lengthy title of this little book gives a very full idea of the contents. The author writes in the Preface that every effort has been made to 'select the most interesting, and essential to give the student an idea of this indispensable science' [i.e. geography]. Also included is an overview of the solar system based on Copernicus. Within the text, the chapter on Botany Bay deals with the Aboriginal people and their food and tools, and with the kangaroo, which in 1790 still intrigued many in Europe. The frontispiece shows Britannia, lion crouched at her feet, and a globe alongside, overseeing the education of the youth of England. 'A new moral system of geography is an example of the books, along with games and dissected puzzles, which were being produced in England to stimulate the teaching of children by making learning fun. This followed John Locke's theory on learning through play that he propounded in 1693, and which was further stimulated by the work of Abbé Gaultier, a French educator who fled the French Revolution and established a school in England. Gaultier issued books and games to support his theories... '. Joints fragile but a delightful copy. Nachrichten von Neapel und Sicilien, auf einer Reise in den Jahren 1785 und 1786 [...]. Group Of Copy Letters From The Woolwich Military Science Laboratory, 1790. London: Woolwich Arsenal, 1790. Fourteen large folio pages, handwritten in neat script with one hand drawn illustration showing the profile of the building as it is to be equipped with a special chimney for the new sulphur refinery - "to carry off the dangerous effluvia".Minor chips and tears to edges, minor spotting.The letters were, apparently, rescued from a bonfire when the storage building at Woolwich Arsenal was demolished in the 1970s. As a group, they provide a view into the daily workings of the most important military research establishment in the British Isles during the eighteenth and nineteenth centuries. The letters make reference to Major William Congreve (later Sir), the Comptroller of the Royal Laboratories at the Royal Arsenal, who ten years after these papers were written won substantial renown as a result of his work on rocket technology. These Congreve rockets, heavily based on Mysorean rockets used against the British East India Company, were used to great effect in subsequent wars, including the Napoleonic Wars.Included in these documents are lists of requirements, including personnel and various ingredients for making cartridges, documents calculating the expense of powder for the war office, and discussion concerning the construction of various engines and pieces of machinary, such as the aforementioned sulphur refinery. Voyages dans le pays des Hottentots... a la Baye Botanique, et dans la Nouvelle Hollande. Traduits de l'Anglois, accompagnés de détails précieux relatifs à M. de la Pérouse. Paris: 1790. 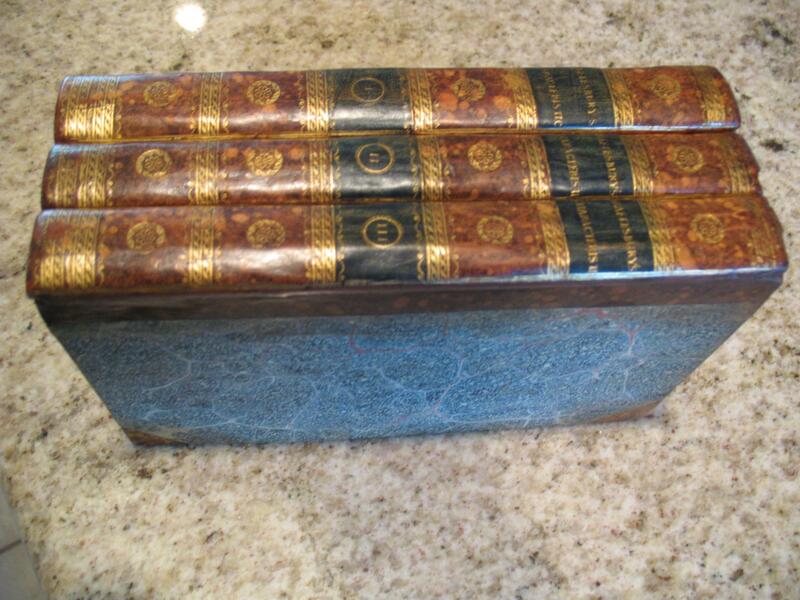 Octavo, two works together; quarter polished calf, rubbed, spine gilt in compartments with morocco label. The second, considerably changed, Letellier version of Tench's account. Letellier had also published a version in 1789: it is not clear whether his edition or that published by Knapen the same year was the first French account of the new colony of New South Wales to appear in print.In this edition the publisher provides Tench's account the first eye-witness account of Australia's settlement - along with the account of La Pérouse at Botany Bay, together with the substantial addition of Patterson's narrative of travels in South Africa.This copy bears the ownership signeture of C. Johannes Brand, superintendent of the East India Company at the Cape of Good Hope. A pencilled note to the front endpaper notes that Captain Cook stayed with Brand at the Cape, and gifted a table to him as a token of appreciation. Very good copy. Paris: Didot l'aîné, 1790. Quarto, with ten folding engraved maps; later half red grained morocco. 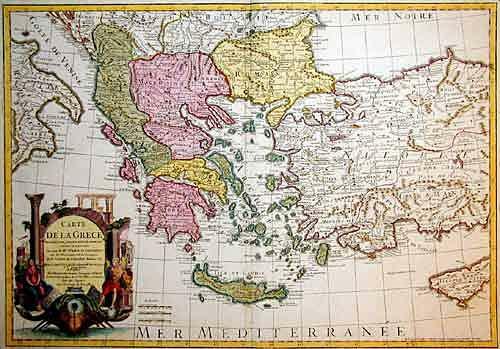 An analysis of the geographical knowledge of the ancient Greeks undertaken by Gossellin for a contest set by the French Academie Royale des Inscriptions. The ten folding maps are particularly interesting for comparing and contrasting the geographical ideas of the major ancient geographers including especially Erastothenes, Strabo and Ptolemy. 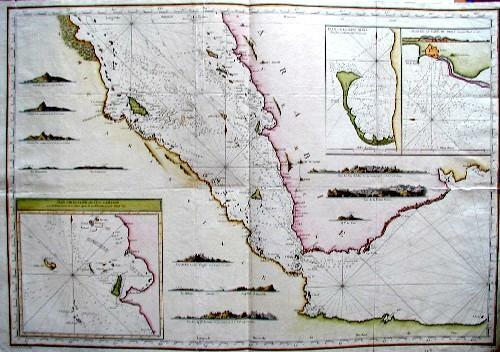 They figure the Mediterranean and the classical world but extend as far east as the Indian sub-continent and the Indian Ocean, with the final map showing the East Indies as far south as the Nicobar Islands.On the basis of this work Gossellin was admitted into the Academie Royale des Inscriptions in 1791; in 1795 it was renamed and subsumed along with the other learned societies, including the main French Academy itself, into the Institut de France. Over subsequent decades the academies would reconstitute themselves but remained under the umbrella of the Institut de France. Gossellin was thus at an early age a member of the most august body in his subject, and in the full French Institute itself.His first work was followed by a wider-ranging four-volume study; the two together constitute his major contribution to the subject. A very good copy. Modern Voyages: Containing a Variety of useful and entertaining Facts... Also, the latest authentic Accounts from Botany Bay... For the amusement and instruction of youth of both sexes. Dublin: Chamberlaine and Rice, P. Wogan and others, 1790. Two volumes, with both half-titles; contemporary mottled calf, flat spines gilt and with double red and green morocco labels. A fine and attractively bound set of voyages collected and edited for the enlightenment of younger readers.Pacific voyagers, including Dampier, Anson, Wallis and Carteret feature heavily in the narratives, while no fewer than four chapters are devoted to the discoveries of Captain Cook. Significantly one chapter includes a plea for a public monument to Cook's memory including a rhyming epitaph of ten lines proposed by the editor Reverend John Adams, who humbly prefaces his composition with this disclaimer 'the following epitaph is laid before the public, in hopes that a perusal of it may incite some gentleman of superior genius to produce something better on the subject and more worthy of that celebrated character... '.Of particular note given the 1790 date of publication, Adams' work also includes thirteen short entries on the newly established penal colony at Botany Bay. These short and enticing articles are edited and simplified from the official account of Governor Arthur Phillip published in London the previous year; they include descriptions of the Aborigines of Port Jackson, early attempts at agriculture and the soil and climate of the colony. Interestingly, the journal narratives of Lieutenant Watts of the convict transport Lady Penrhyn and of Captain Marshall of the Scarborough are included in simplified form. The natural history of New South Wales features in two entries, one on a peculiar shark and another on a dingo sent as a gift from Governor Phillip to Mr. Nepean in England, and now in the possession of the Marchioness of Salisbury at Hatfield House. The handsome features and ferocity of the dingo are admired though it is noted that 'it is scarcely to be expected that this elegant animal will ever become familiar. 'First published in London in 1790 by Kearsley, this Dublin imprint is of some rarity: Beddie was able to locate only one copy, in the State Library of Victoria; Forbes located just three other copies, including one in the Mitchell Library. A handsome set. Lisboa, Na Regia officina typografica, 1790. ____ Première édition de la "Lumière de l'art libéral et noble de la cavalerie". C'est le plus bel ouvrage de l'école d'équitation portugaise. Illustré par un portrait frontispice de Joao VI de Portugal et de 93 belles planches gravées dont 22 dépliantes et 2 vignettes de titre et 3 belles lettrines. Les illustrations sont de Joaquim Carneiro da Silva. Le Marquis de Marialva est à l'origine de la partie technique de l'ouvrage. Cet instructeur de la cour royale, a tellement marqué l'équitation portugaise, que l'on applique encore aujourd'hui " l'arte de Marialva" dans les courses de taureaux. Bon exemplaire. ***** First edition. This is the most handsome work on horsemanship of the Portuguese school. Engraved portrait frontispiece of John VI of Portugal, 93 plates (22 of which folding) after Joaquim Carneiro da Silva, and 2 engraved head-piece vignettes, 3 engraved historiated initials. The Marquis of Marialva was responsible for the technical part of the treatise. Dom Pedro Alcantara y Meneses, fourth Marquis of Marialva, Master of the Horse to the royal court, emerged as one of the most influential horsemen of post renaissance Europe. His influence in laying down the modern day rules of Portuguese equestrian bullfighting was so great, that this type of bullfighting is also referred as the Art of Marialva. In-folio. Collation : portrait, XXVI, 213 pp., faux-titre, 216 à 454, (1) pp., 93 planches h.-t. Basane havane marbrée, dos lisse orné, tranches marbrées. (Reliure du XIXe.). Portrait de Benjamin Franklin, produit par étincelle électrique. (après 1790). ____ Portrait sur soie encadré sous verre, (taille du cadre : 105 x 93 mm), légendé "B. Franclin". Il porte à la plume dans le bas du cadre cette mention : "Par S.d. de Lafond à son ami Cadauta" et au verso "Produit par étincelle électrique." J'ai trouvé dans les "Récréations" de Guyot la description de cette "récréation physique". "Dessinez sur du papier fin et uni, de la grandeur d'une carte à jouer, une tête d'un pouce ou un pouce et demi de grandeur ou servez vous tout simplement d'une gravure. Découpez en à jour sous les traits ... Faire construire une presse." ... Il faut serrer le portrait entre des plaques de bois avec une feuille de papier blanc ou de satin et par dessous une feuille d'or. Puis l'on fait passer une "explosion" électrique à travers la feuille d'or. "Si le l'explosion a été bien forte, ce portrait se trouvera parfaitement imprimé sur le papier ou le satin de même que s'il l'eut été avec une planche en taille-douce : cette impression, occasionnée par la fusion de cette feuille d'or qui aura été réduite en chaux, sera ineffaçable." (Guyot, Nouvelles récréations physiques et mathématiques, 1786. Tome 1, p. 349.) La mention manuscrite n'est pas très lisible, mais semble bien attribuer la réalisation de ce portrait à Joseph Sigaud de Lafon (1730-1810) célèbre professeur et démonstrateur de physique expérimentale et maître de mathématiques en l'Université de Paris. Objet en très bon état. ***** Portrait on silk, framed under glass, of Benjamin Franklin. "Produced by electric spark". Guyot, in his "Nouvelles récréations physiques et mathématiques, 1786" described at long the device used to make this portrait. Probably made by the famous professor of physics, Joseph Sigaud de Lafon. . [48 x 48 mm] Collation :. FONTENELLE, Bernard le Bouvier de. Paris: Jean-Francois Bastien, 1790. Eight volumes, octavo, engraved portrait frontispiece in volume 1 and a folding plate in vol. 2; a fine set in contemporary French polished marbled calf; flat spines ornately gilt with double red labels. A very attractive set of Fontenelle's works, including his enormously popular Entretiens sur la Pluralité des Mondes: this utopian analysis of the universe took Europe by storm and was precursor and inspiration to scores of imitations. It was first published in 1686, and first translated into English by Aphra Behn only two years later.Although the Entretiens clearly owes a tremendous debt to the astronomical traditions of Galileo and Brahe, Fontenelle's sensational tale of the inhabitants in 'other planets, in other galaxies, and even on comets, could hardly fail to captivate' (Nina Rattner Gelbart, Introduction to the Conversations on the Plurality of Worlds). In the form of an elegant dialogue between a scientist and a Marquise, it takes as its starting point that 'Toute la philosophie n'est fondée sur deux choses: sur ce qu'on a l'esprit curieux et les yeux mauvais': that is, that if we had a perfect understanding we would not need science because all would be spontaneously revealed. Meant as a quick summation of scientific discovery, but also as pure speculation on the possibilities of the universe, it suggests that as it has taken six millennia for Europeans to cross the Atlantic Ocean to America, it may take a little longer for the inhabitants of other worlds to cross the far greater expanses of space.This set also includes 'Dialogues des Morts anciens' and 'Histoire des Oracles', works which exemplify Fontenelle's desire to propagate philosophical thinking. Voltaire described Fontenelle as having the most universal mind produced by the era of Louis XIV. One or two joints slightly weak. Narrations d'Omaï, insulaire de la mer du sud, ami et compagnon de voyage du Capitaine Cook. Ouvrage traduit de l'O-taïtien, par M. K***, & publié par le Capitaine L.A.B. Rouen: Chez de Boucher, 1790. Four volumes, octavo, portrait frontispiece to volume one ("Omaï amené en Angletere par le Capitaine Furneaux"), wood-engraved headpieces; some early jottings on verso of frontispiece and final leaf of volume one, a handsome set in early quarter calf, spines gilt. First edition of this romantic fantasy about Omai, the Tahitian islander brought back to England by Cook. This is, with Elliott's Hildebrand Bowman, one of the two key imaginary voyages which relate specifically to Cook's voyages.Canon Baston (1741-1825) was a native of Rouen who published many works on rather arcane questions of theology, making it all the more surprising that he should be the author of this extraordinary work: an imaginary autobiography of Omai concentrating on the Tahitian's visit to Europe.Omai's visit to Europe was indeed newsworthy: despite Cook's initial objections, Omai was taken on board the Adventure, which returned to Portsmouth in July 1774. Given into the custody of Banks and Solander, Omai was fêted by the English public and widely seen as the embodiment of Rousseauist ideals of the noble savage. The public's fascination was reflected by the huge success of the long-running pantomime Omai: or a Trip Round the World, staged by Loutherbourg and Shield.Baston's long novel purports to be the autobiography of Omai translated from the Tahitian (it includes a four-page glossary of difficult Tahitian terms). Seen by Tarlton and McCormick as Omai's 'supreme literary tribute', the fantasy borrows heavily from the utopian imaginary voyage tradition by depicting Omai as the 'saviour of his people, a leader who on returning from England purges his society of all its evils while he introduces only the benefits of European civilisation' (Auckland City Art Gallery, The Two Worlds of Omai, 1977, p. 14).Unlike his compatriot Diderot, whose writings on Autorou - the Tahitian who returned with Bougainville to France - are marked by bitter regret at the European influence on the Pacific, Baston depicts an idyllic synthesis of Tahitian innate nobility being enhanced and purified by contact with Europe. Tragically, of course, it was Diderot's cynicism which provided a far more accurate appraisal of the coming destruction of Polynesian society, a fact which increases the historical fascination of Baston's portrait of bucolic harmony. The Works of the English Poets. With Prefaces, biographical and critical, by Samuel Johnson. London: printed by John Nichols; for J. Buckland, J. Rivington and Sons, T. Payne and Sons [and 39 others], 1790 - 75 volumes, small octavo (158 × 97 mm). Contemporary red straight-grain morocco, smooth spines divided into six compartments by gilt bands, gilt-lettered direct, single fillet on sides, turn-ins gilt with flower-head-and-leaf roll, marbled endpapers, gilt edges. With the occasional and inconsequential mark, a bright, fresh set, splendid in contemporary red straight-grain morocco. 34 engraved portrait plates (all but two of which to the biographical volumes, 1-6), text printed on Whatman wove paper. Second edition of The Works of the Poets, with 14 authors, including Johnson himself, added to the original selection of 1779&#150;81. The ultimate literary success of Johnson's career, his prefaces were quickly recognized as setting a new standard for English literary biography. "In particular, the surveys of Cowley, Milton, Dryden, Swift, and Pope exemplify Johnson's serious concern with the deepest springs of creativity, as well as his ability to explore with considerable insight some individuals whose character and work aroused profound antipathy in him. Even in an age of greater theoretical sophistication, his reading of mainstream poetry from the seventeenth and eighteenth centuries remains canonical, by reason of its attention to verbal detail, its decisive judgments, and its robust expression" (ODNB). A wonderful set of a highly important (and enjoyable) production. Kaart van het zuidelyk gedeelte van Afrika tot verstand van de twee Reizen van Le Vaillant". - Kupferstich-Karte von C. van Baarsel, ca. 1790. Ca. 40 x 58,8 cm. Faltspuren, zwei Fehlstellen im Bereich des 15. Längengrads. Not in Norwich-Stone, Maps of Africa. Compare pages 204/05, map No. 181. 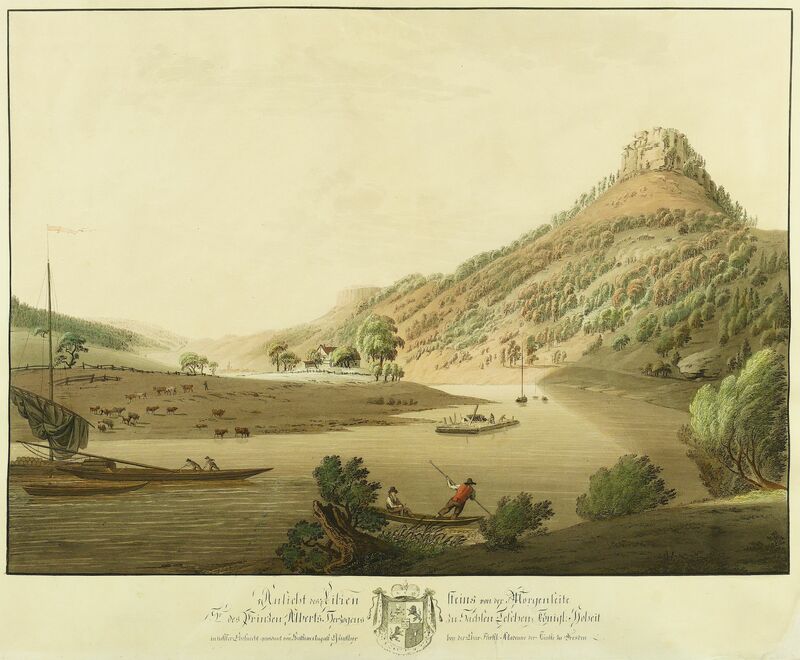 Seltene Karte der Reisen von Francois Levaillant in Südafrika, gestochen vom holländischen Kupferstecher C. van Baarsel (1761-1826), rechts unten mit der Stechersignatur "C. van Baarsel scuplt.". Die detaillierte Karte zeigt Südafrika mit den eingezeichneten Reiserouten (und Ereignissen). Francois Le Vaillant (1753-1824) aus Surinam unternahm in den Jahren 1783-85 zwei große Reisen durchs Kapland mit wichtigen Ergebnissen zur Kenntnis der Zoologie, besonders der Ornithologie, sowie der afrikanischen Volksstämme. Rare map of Southafrica, depicting the two journeys of F. Levaillant in 1783-1785. The map is not in Norwich-Stone, Maps of Africa, and we cannot trace it in the trade worldwide. Map 181 in Norwich-Stone is probably copied after the present map, because our map shows more details, as for ex. the "Wooning" and "Legerplats" of the journeys. Two repairs (see picture). Crease hints, two wholes at the area of the 15th longitude. Gesamtansicht, mit Schloß Friedensburg, "Das Berg Schloss Liegtimbergen im Coburgschen I. Vue". - lavierte Umrißkupferstich v. Carl Benjamin Schwarz aus Schwarz, Reise an der Saale, um 1790, 18,5 x 28,5 Sehr seltene Ansicht. Nachweis nur im Stadtmuseum Jena. Siehe Birgitt Hellmann, Die Radierungen des Leipziger Künstlers Carl Benjamin Schwarz ( = Katalog der Städtischen Museen Jena), Seite 18. DESCRIPTIO ET ADUMBRATIO PLANTARUM E CLASSE CRYPTOGAMICA LINNAEI QUAE LICHENES DICUNTUR. Lipsiae, Apud Siegfried Lebrecht Crusium, 1790. 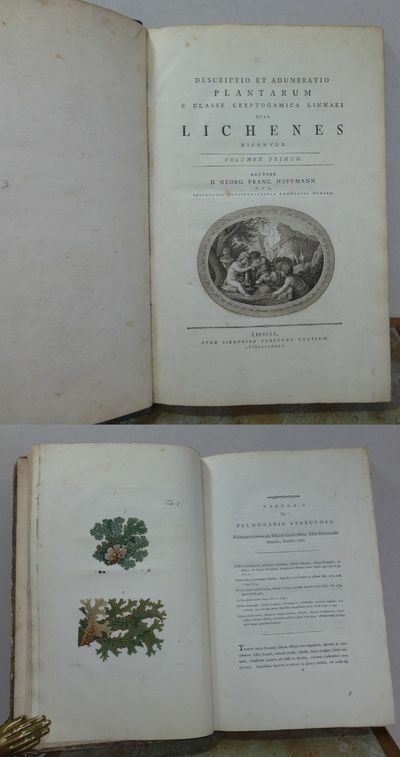 FIRST EDITION 1790, VOLUME 1 and first part of VOLUME 2, (Fasc. 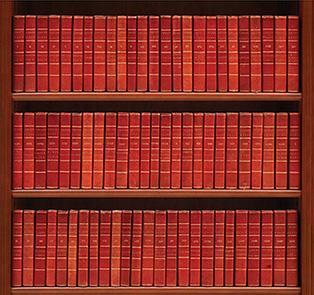 1) ONLY OF 3 VOLUME SET, bound in 1 volume. TEXT IN LATIN, LACKS TITLE PAGE TO VOLUME 2. Folio approximately 375 x 240 mm, 14¾ x 9½ inches, engraved vignette to title page, 31 engraved plates, 30 HAND COLOURED PLATES, PLUS 1 UNCOLOURED PLATE, pages: , ,1-104; Volume 2, first part, index to plates 25-30 on pink paper followed by Dedication to Charles Theodore, pages: 1-21, , bound in quarter green cloth, with part of gilt lettered leather label to spine, marbled paper boards. Binding rubbed and worn, hinges of spine cracked and re-glued, marbled covers rubbed and scuffed, corners worn with board showing, shelf wear to edges with loss of marbled paper, 1 colour plate has pale browning to margins not affecting image, pastedowns and endpapers a little dusty and with light browning, light foxing to prelims, a little pale foxing to a few plates, the pink list of plates to Volume 2 has pale offset to pages either side, a few margins slightly dusty with occasional small spot, otherwise a very good copy, no loose pages, in worn binding. Georg Franz Hoffmann was a German botanist and lichenologist, After graduating from the University of Erlangen in 1786, he worked there between 1787 and 1792 as a professor of botany. Between 1792 and 1803 he was Head of the Botany Department and Director of the Botanical Garden of Göttingen University. Already a famous botanist, in particular for his work on lichens, he settled in Moscow in January 1804 and directed the Department of Botany at the University of Moscow as well as the Botanical Garden. (Wikipedia). MORE IMAGES ATTACHED TO THIS LISTING, ALL ZOOMABLE, FURTHER IMAGES ON REQUEST. POSTAGE AT COST. Svea rikes historia under konung Gustaf Adolf den stores regering. I-V. Sthlm, J. A. Carlbohm, 1790-96. 8:o. (12),411,(1) + (6),411-889,(3) + (6),478 + (6),481-1044 s. & 2 utvikbara grav. kartor + (6),463 s. Med grav. titelvinjetter. Fem vackra och välbevarade samtida ljusbruna hfrbd med rikt guldornerade ryggar, tegelbruna titeletiketter och gröna deltiteletiketter. Blå- och brunstänkta snitt. Ställvis något lagerfläckiga. I andra delen ett fåtal små bläckfläckar och ett litet rosthål i marginalen på s. 641-42. Kartorna i fjärde delen är något lagerfläckiga. Praktsvit ur Carl Ulrik Palms bibliotek. Setterwall Svensk historisk bibliografi 1535. Allt som utkom. Behandlar tiden fram till 1626. De graverade vinjetterna signerade J. Snack. Kartorna, som återfinns i fjärde delen, föreställer den misslyckade belägringen av Pleskow 1615. Författaren, historikern och numismatikern Jonas Hallenberg (1748-1834) var riksantikvarie och Vitterhetsakademiens sekreterare. Han hade för avsikt att avsluta arbetet men avbröt det efter det femte bandet "på grund af bristande uppmuntran". Geijer kallade arbetet "ett mästerverk" och det är det viktigaste verket rörande Sveriges nyare historia som utgavs under 1700-talet. Karte des Bodensees mit der weiteren Umgebung. Plan particulier de l Isle Cameran. Sächsische Schweiz. - Lilienstein. - Günther. - "Ansicht des Liliensteins von der Morgenseite". - Historische Ortsansicht. Radierung / Umrissradierung, alt koloriert, um 1790. Von Christian August Günther. 46,3 x 64,0 cm (Darstellung) / 55,5 x 68,0 cm (Blatt). Der Name des Künstlers taucht in der Widmung unterhalb der Darstellung an Albert Kasimir von Sachsen-Teschen. Titel ebenso unterhalb der Darstellung. - Blatt mit fachkundig restaurierten oberen Rand und Eckausriß unten rechts. Ingesamt aber guter Erhaltungszustand und recht wohlerhaltenem Kolorit. Christian August Günther (1759 Pirna - 1824 Dresden). Deutscher Kupferstecher und Radierer. Schüler an der Dresdner Kunstakademie bei Adrian Zingg. Bekanntschaft mit Johann Gottlob Schumann, Anton Graff, Joseph Grassi, Crescentius Josephus Johannes Seydelmann und Guiseppe Canale. Seit 1789 war er Pensionär, ab 1810 Mitglied der Dresdner Akademie. 1815 wurde er zum außerordentlichen Professor ernannt. Herzog Albert von Sachsen-Tetschen förderte ihn. Einige seiner besten Blätter befinden sich daher in der Wiener Albertina. Hauptsächlich schuf er Ansichten der Meißner Albrechtsburg, der Festung Königstein, des Liliensteins, des Schlosses Pillnitz, der Orte Seiffersdorf, Loschwitz, Potschappel, Tharandt und Leipzig, illustrierte aber auch Reisebeschreibungen von Friedrich Schlenkert und Johann Jakob Brückner. Ab den 1790er Jahren ist ein romantischer Stil erkennbar. Abbildung verschiedener öffentlicher und Privat-Gebäude zu Leipzig. Das Rathaus, die Börse usw. wie es theils war, theils noch ist. 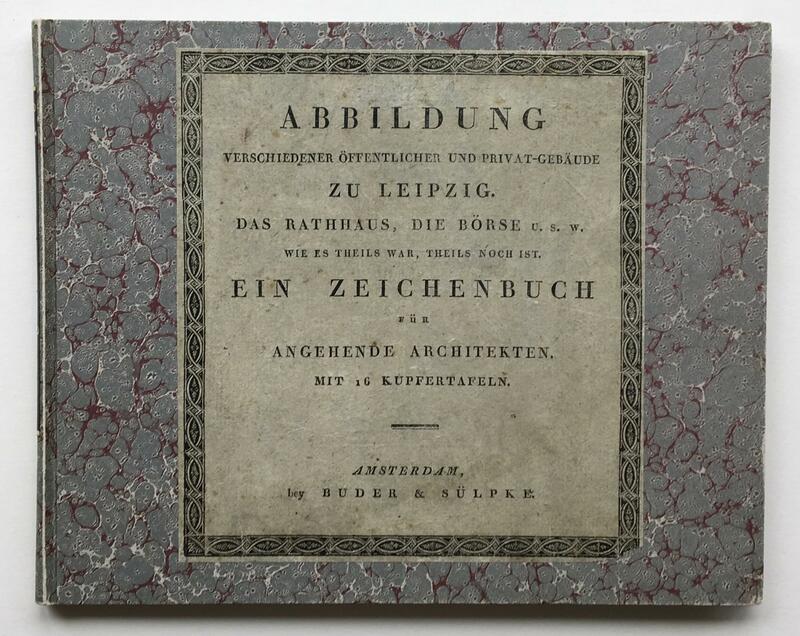 Ein Zeichenbuch für angehende Architekten. Mit 16 Kupfertafeln. - Kupferstich-Karte (von G. L. Le Rouge) bei (J. C.) Dezauche, datiert Paris 1790, grenz- und flächenkoloriert. Von 12 Platten gedruckt und zusammengesetzt, 227 x 153 cm. Stellenweise leicht fleckig, wenige Knickfalten. Einige alte Wurmlöcher sachgerecht restauriert. Alt mit Leinen hinterlegt, am oberen und unteren Rand mit einem schwarzen Holzstab zur Aufhängung versehen. Vgl. Tooley, Mapmakers III, 121 u. BM, Maps VIII, 967 (jeweils EA). Prachtvolle und seltene Wandkarte in der Begrenzung Texel-Emden-Roermond-Goeree. Eingezeichnet sind jeweils Linien zum Teilen der Gr.-fol.-Blätter in 48 Detailkarten (jeweils mit der Num. oben rechts); die Nebentitel lauten auf Bl. 6 "Nova BELGII FOEDERATI Tabula ex optimis annotationibus Composita et ad usum Commodum in XII sectionibus exhibita, a PARISIIS, Apud Crepy in via S. Jacoboea" und auf Bl. 25 "Partie Meridionale des XVII. Provinces-Unies en Six Feuilles". Beide Teile waren auch einzeln lieferbar. Mit rotem Stempel "Depot Général de la Guerre" in der Titelkartusche. 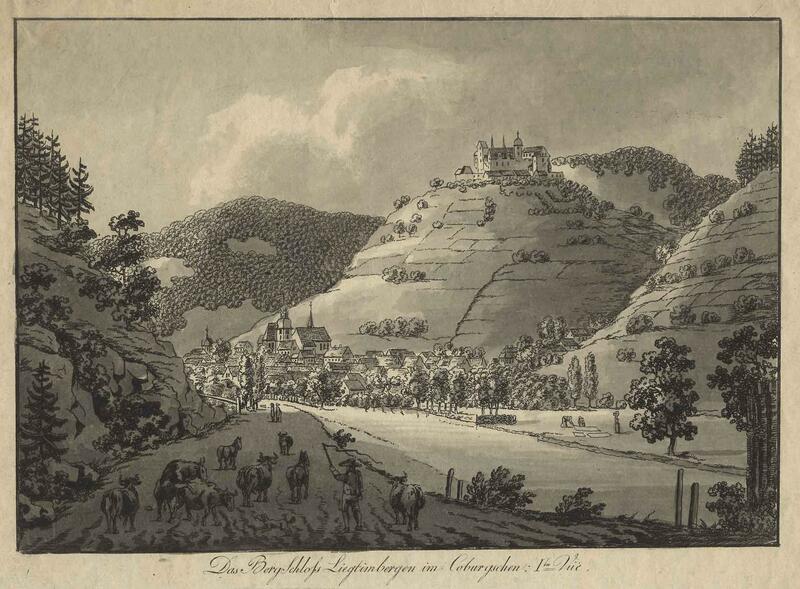 Erstmals 1748 bei Lerouge erschienene Monumentalkarte, 1770 von Crepy erneut und schließlich zuletzt 1790 - wie hier vorliegend - von Dezauche herausgegeben. Die gestochene Dedication an den König wurde (ein Jahr nach der Französischen Revolution) schlicht überklebt. 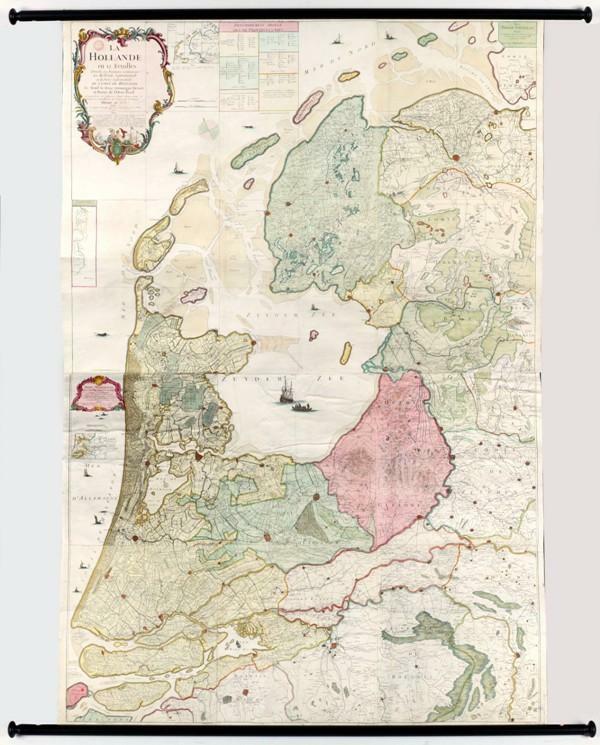 Third and last state of this very large and rare wall map of the Netherlands (230 x 150 cm), first published in 1748 by Le Rouge, then in 1770 by Jean Crepy. 12 sheets, pasted together as proposed, backed with linnen, attractive hand-colouring, black wooden stakes. Some carfully restored wormholes, but a good copy of this rare wall map. 1790.  feuillet, 55 gravures sur , 1790-1811 pour les planches ; ensemble compilé vers le milieu du XIXe siècle, ,  feuillet, 55 gravures sur cuivre coloriées à la main,  page d'index, toile chagrinée verte, muette, 55 planches extraites de l'édition originale de l'ouvrage majeur de James SOWERBY, English botany, or Coloured figures of British plants, parue entre 1790 et 1814 (en tout : 8 volumes, 2592 planches en couleurs). La lettre contient la date et le lieu de publication de chacune d'elles (1790 à 1811). Ensemble ravissant mis en recueil par un amateur britannique qui a noté un titre, numéroté ses planches de 1 à 55, et, au verso, a ajouté un commentaire en anglais : "The name are taken from and in the order of Dr Withering's Arrangement of British Plants abridged by Macgillivray..." ; la nomenclature des fougères, lycopodes et prêles qu'il a choisi de suivre n'est pas celle de Sowerby, mais elle provient de l'ouvrage de William WITHERING, A Systematic Arrangement of British Plants, dans sa version abrégée par Macgillivray, dont il y a eu plusieurs éditions entre 1830 et 1858. Le nom de chaque espèce a été reporté, manuellement, au pied des planches. Ex-libris manuscrit à l'encre au contreplat : Ellis. Quelques rousseurs légères, principalement en tête et en fin d'ouvrage. Dos insolé et petites taches sur les plats. Pritzel n° 8789 et 10360.
by Cornelis Sebille Roos|& Aren Fokke, 1790. 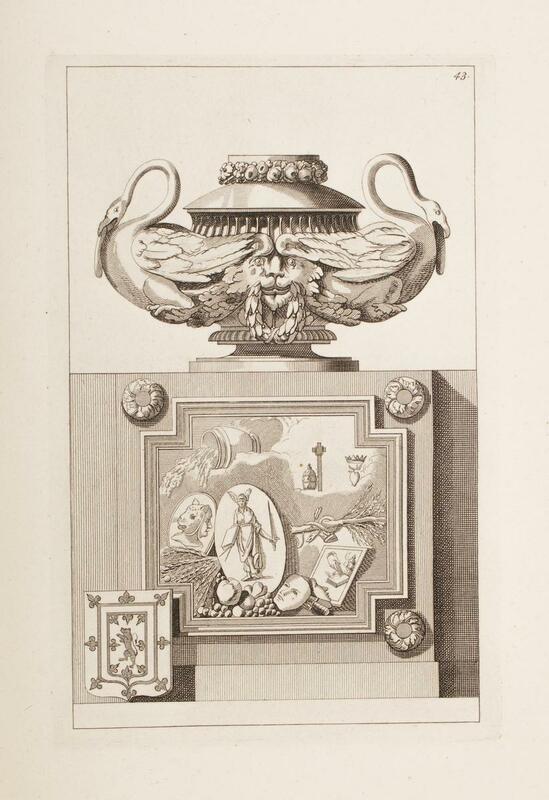 - by Cornelis Sebille Roos & Aren Fokke, Te Amsterdam 1790, In-folio (27x43cm), relié. 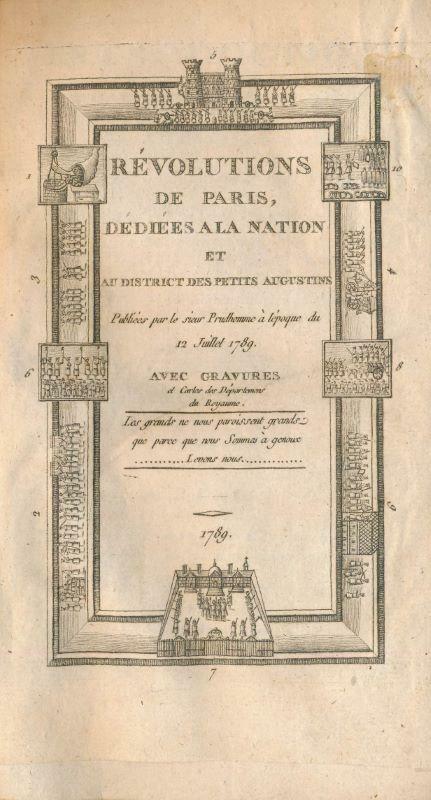 - edizione - [FRENCH VERSION FOLLOWS] Edition originale bilingue en français et néerlandais illustrée de 2 frontispice et 103 planches numérotées. 39 pages de texte d'explication des planches avec la traduction hollandaise en regard. Reliure en demi veau brun d'époque. Plats modernes refaits à l'aide d'un simili cuir. Gardes également refaites. Pièce de titre en maroquin rouge. Coiffe de queue arrachée laissant apparaître un adhésif. Un nerf manquant. Appréciable fraîcheur du papier. Exemplaire à toutes marges. Cet architecte et ornemaniste a beaucoup contribué par la publication de ses recueils à la formation du style Louis XVI et au premier style néo-classique. L'ouvrage constitue un répertoire ornemental pour les fontaines, pyramides, cheminées, dessus de porte, bordures, médaillons, trophées, vases, frises tombeaux, pendules, etc. La manière de Delafosse utilise la force symbolique de l'allégorie en utilisant un langage iconique souvent très fantasmatique. [London, 1790. Two watercolors, each on laid paper, each approximately 9¾ x 13¾ inches. Matted and framed. Two original watercolors by Sarah Stone of American species of ducks.A splendid pair of original watercolors featuring ducks by Sarah Smith (née Stone), a prolific painter of natural history subjects in London between 1777 and 1806. Stone worked exclusively for Sir Ashton Lever, documenting Lever's vast private collection of ornithological, zoological, and ethnographical specimens. Stone's work is admired today for the delicacy of the brushwork, a deft touch with color, and the requisite skill necessary to tackle such a diverse range of subject matter. Of the various subjects which Stone saw fit to translate to canvas, ornithological subjects were her favorite, and constitute the majority of her known work. Her earliest studies of birds date from 1777, when she was only seventeen years old. At the time, she concentrated her efforts on the sole subject at hand, only later adding backgrounds and other life subjects into her paintings. Stone also favored sized paper, an uncommon practice at this time in British painting, and used exceedingly fine brush strokes, with brushes used for the lightest feathers likely containing only one or two hairs. Though unsigned and undated, it is likely that the current examples emanate from this early period of Stone's work, since the ducks are featured by themselves, and on sized, laid paper, and exhibit Stone's fine brushwork. In addition, the contemporary ink annotations along the top edge are in the same hand, though not Stone's hand, as other known ornithological examples of her work dated before 1790.Whomever they belong to, the contemporary notations on Stone's work contain important information about each subject, including the name of each duck, in this case the "Buffel-headed Duck" and the male "King Duck." Following the name of each duck is a citation corresponding to John Latham's General Synopsis , published between 1781 and 1785. For example, the Buffle-headed duck carries the annotation "La. Syn. 6. p.533" which corresponds to Latham, Synopsis , volume six, page 533. A similar notation is found along the top edge of the King Eider duck. This is a practice peculiar to known examples of Stone's birds, since she and Latham were working from some of the same specimens in the Leverian Museum. Further, Latham specifies in his text for the General Synopsis that he used specimens from both his own extensive collection and that of his specimen-collecting rival, Ashton Lever. Each painting also displays an annotation in Latin along the top right edge, corresponding to the subject's Linnaean classification.Interestingly, in 1781, Lever acquired thousands of natural history specimens from Captain Cook's third voyage. It is possible that these two paintings represent ducks collected by Cook's crew on the Northwest Coast of America. "During the late 1770s and throughout the 1780s, Sarah painted at Ashton Lever's museum (or the Leverian Museum, as it came to be called) in Leicester House, Leicester Square, London. She may have asked permission to draw some object from this extraordinary collection of natural history specimens, ethnographical artefacts and other curiosities, and so came to the notice of their owner. Ashton Lever soon commissioned her to record the outstanding articles, both zoological and ethnographical, in his collection. Sarah signed her watercolors, and dated some of them, but the signed and dated watercolors are in the minority" - Jackson. Indeed, Lever held a high opinion of Stone's work, commenting in an advertisement for an exhibition of over 1,000 of Stone's watercolors at his museum in 1784 that Stone had "succeeded in the effort beyond all imagination. "Both of these paintings come from Credit Suisse's Americana Collection and were previously held by the Wall Street investment firm of Donaldson, Lufkin & Jenrette (acquired by Credit Suisse in August 2000). The paintings were likely acquired by Richard Jenrette at Sotheby Parke- Bernet Galleries in New York in April 1968, where Stone paintings of a Bufflehead and a King Eider were offered. 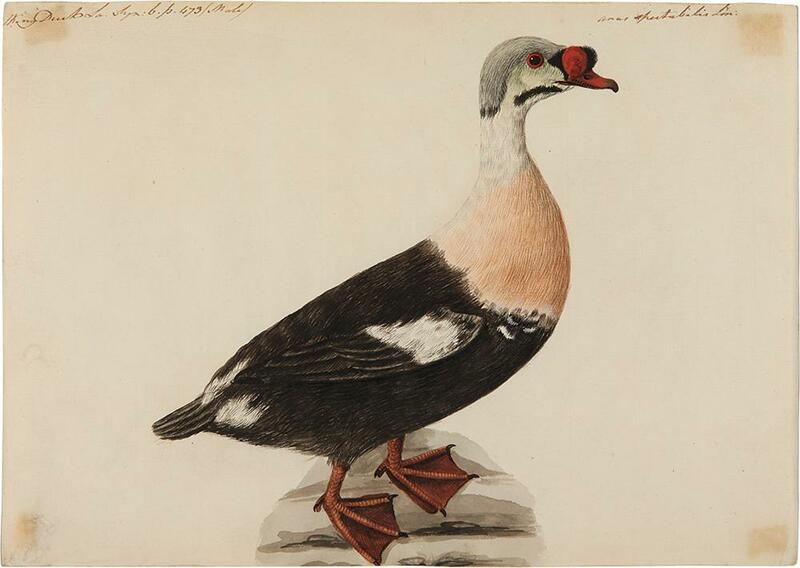 In that sale, the King Eider duck achieved $350 by itself.A stunning pair of paintings from an artist whose place of importance in the history of 18th-century ornithological studies is only beginning to be realized.Jackson, Christine E. Sarah Stone. Natural Curiosities from the New Worlds . (London: Merrell Holberton and the Natural History Museum, London, 1998), pp.9-36;138. -41 pages, une planche Brescia, della stamperia Pasini, 1790, in-8, -41 pages, une planche dépliante, broché, couverture de papier dominoté de l'époque, Planche gravée en taille-douce par Beceni d'après Gaspard Turbini figurant des claies pour l'élevage des vers à soie. Première édition de cette Nouvelle méthode pour faire éclore les vers à soie, lue à l'origine à l'Académie agraire de Brescia le 25 février 1790. L'ouvrage a reparu en 1799. Ouvrage rare. Bel exemplaire, avec couverture d'attente de papier dominoté italien de l'époque, imprimé à la planche en vert olive, jaune et rouge au patron, d'aspect brillant, sans doute brunie à l'agate. Exemplaire provenant des archives de Jean-Denis-François Camus, abbé de Nancy, avec sa mention manuscrite au contreplat : "donné par l'auteur à Brescia le 1er mai 1793". Joint : une carte de visite de l'auteur, manuscrite sur papier gaufré, portant le nom de l'auteur au verso, Maggi Conte Carlo, et un petit message adressé à l'abbé Camus au verso : "J'étais venu vous trouver pour voir si je pouvais vous être utile en quelque chose. Voici un petit livre qui n'a pas été inutile, même dans la Lombardie autrichienne. C'est l'unique motif qui m'encourage à vous en faire l'hommage". Vicaire Général de Nancy, Jean-Denis-François Camus (1752-1814) émigra dans les dernières semaines de l'année 1791 et prit la route d'Italie ; ce personnage à vocation académique, membre de plusieurs sociétés savantes de France, d'Allemagne et d'Italie, évolua avec aisance dans les milieux des érudits italiens. Il eut des contacts et des correspondances avec les plus grands d'entre eux, Tiraboschi, Bandini, Spallanzani, Giuseppe Gioeni, l'abbé Fortis, etc. Au cours de son périple italien, qui dura jusqu'à la fin de l'année 1793, ces nouvelles connaissances lui offrirent de nombreux ouvrages. Camus prit également des notes de voyage, en vue de la publication d'un Voyage en Italie, demeuré à l'état de manuscrit : une partie de ces cahiers vient d'être redécouverte. London - G Nicol, 1790 Book. Very Good. Hardcover. 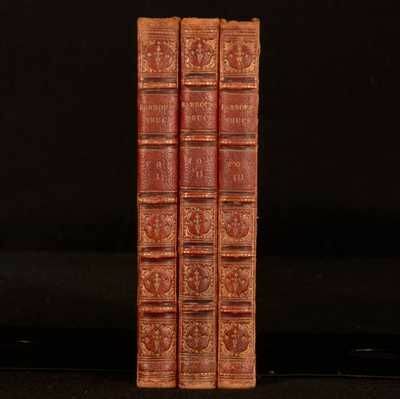 The complete three volumes of John Barbour'sThe Bruce. The first 'genuineedition',published from a manuscript dated 1489. With notes and a Glossary by J Pinkerton. With a vignettetitlepage to all volumes. With an interesting hand written inscription to the verso of the leaf prior to the glossary of volume III. Possibly written in a Celtic language. Previously owned by William Douglas Simpson, a Scottish architecture and archaeologyacademic. Douglas Simpson was theAssistant in History at the University of Aberdeen, before becoming a lecturerin British history. He was also librarian at Aberdeen Universityfor fifty years. The Bruceis the principal surviving work by John Barbour. Thishistoricalverse romanceearned Barboura well established reputation. The Bruce is a long narrative poem in just under 14. 000 octosyllabic lines which gives a chivalric accountof Robert the Bruce and the Black douglas in the Scottish Wars of Independence. Condition: In half morocco bindings with gilt stamping to spines. Externally, generally smart with slight rubbing to the extremities, joints and to the head and tail of spines. Front hinges to volumes I and III are slightly strained but firm. Small loss to the head of spines to volumes I and III due to rubbing. Internally, all volumes are firmly bound. Prior owner's signatures to recto of front endpapers to all volumes W Douglas Simpson, 1953 of Old Aberdeen. Another prior owner's signature to recto of front endpaper to volume I only, John Nichol first of January 1856. Prior owner's writings in blackletter to the verso of final leaf of text, prior to the glossary, to volume three. Pages are slightly age toned to edges with the odd spot throughout. Overall: VERY GOOD..
Lipsiae, Apud Siegfried Lebrecht Crusium, 1790.. FIRST EDITION 1790, VOLUME 1 and first part of VOLUME 2, (Fasc. 1) ONLY OF 3 VOLUME SET, bound in 1 volume. TEXT IN LATIN, LACKS TITLE PAGE TO VOLUME 2. Folio approximately 375 x 240 mm, 14Â¾ x 9Â½ inches, engraved vignette to title page, 31 engraved plates, 30 HAND COLOURED PLATES, PLUS 1 UNCOLOURED PLATE, pages: , ,1-104; Volume 2, first part, index to plates 25-30 on pink paper followed by Dedication to Charles Theodore, pages: 1-21, , bound in quarter green cloth, with part of gilt lettered leather label to spine, marbled paper boards. Binding rubbed and worn, hinges of spine cracked and re-glued, marbled covers rubbed and scuffed, corners worn with board showing, shelf wear to edges with loss of marbled paper, 1 colour plate has pale browning to margins not affecting image, pastedowns and endpapers a little dusty and with light browning, light foxing to prelims, a little pale foxing to a few plates, the pink list of plates to Volume 2 has pale offset to pages either side, a few margins slightly dusty with occasional small spot, otherwise a very good copy, no loose pages, in worn binding. Georg Franz Hoffmann was a German botanist and lichenologist, After graduating from the University of Erlangen in 1786, he worked there between 1787 and 1792 as a professor of botany. Between 1792 and 1803 he was Head of the Botany Department and Director of the Botanical Garden of GÃ¶ttingen University. Already a famous botanist, in particular for his work on lichens, he settled in Moscow in January 1804 and directed the Department of Botany at the University of Moscow as well as the Botanical Garden. (Wikipedia). MORE IMAGES ATTACHED TO THIS LISTING, ALL ZOOMABLE, FURTHER IMAGES ON REQUEST. POSTAGE AT COST. Typis Jo. Mar. Bruyset, (1790). In-8° (218x139mm), pp.XXIV, 482, legatura ottocentesca m. tela con ttolo e decori a catenella in oro al dorso. Piatti in cartone marmorizzato con decoro a fogliame in rosso e in verde. 3 tavv. incise su rame f.t. in fine, di cui 2 ripiegate. In barbe, con qualche ingiallitura e fioritura. La numerazione delle tav. è IX-XI, ma le schede degli esemplari commercializzati in precedenza o censiti in biblioteche pubbliche discorrono appunto di sole 3 tavole, dato che conferma la completezza dell'esemplare. Edizione originale di questo studio di fitoclassificazione secondo l'ordinamento linneiano. Il Gilibert (Lione, 1741-ivi, 1814), medico e naturalista, fu professore di scienze naturali in diverse università polacche (su consiglio e segnalazione di Haller) e poi alla Scuola Centrale del Dipartimento del Rodano, Presidente della Società di Agricoltura lionese, Segretario perpetuo della Società di Medicina, membro di numerose società mediche ed agricole, tra cui l'Athénée della sua città natale, nella quale ricoprì anche la carica di sindaco. Presidente della Commissione Dipartimentale durante l'assedio di Lione, nel corso di esso fu dapprima incarcerato (lui, girondino, era ovviamente osteggiato dai montagnardi) e poi liberato nel maggio 1793, divenendo Presidente della Commissione di Salute Pubblica e animando strenuamente la resistenza lionese a Robespierre e alle armate montagnarde. Obbligato alla fuga e all'esilio errabondo, condusse una serie di inenarrabili peregrinazioni che solo dopo 18 mesi lo resero al luogo natio. I suoi scritti a stampa spaziano dalla medicina (in cui incessantemente sostenne la bontà e superiorità dei rimedi naturali) alla zoologia alla botanica (in quest'àmbito lasciò tra l'altro una sistematica classificazione della flora della Lituania). Soulsby, 735. Hancock Natural History Collection, G-8. Manca al Nissen e al Pritzel. Cfr. E. Sainte-Marie, Éloge historique de M. J. E. Gilibert, Lione, 1814. Die Eisenbahnen und deren Aktionäre in ihrem Verhältnis zum Staat. 163 Seiten, 3 ausfaltbare Tabellen. 8, Pappeinband der Zeit. Der Einband etwas berieben, Ecken bestoßen. Schmutztitel fehlt. Titel mit Stempel: Koen.Pr.Statistisches Bureau. Im Innendeckem hs Standortsignatur in Blei (und wohl Kopierstift). Guter Zustand.David Justus Ludwig Hansemann (* 12. Juli 1790 in Finkenwerder bei Hamburg 4. August 1864 in Schlangenbad) war Kaufmann und Bankier. Er förderte den Eisenbahnbau und gründete Versicherungen und Banken, darunter mit der Disconto-Gesellschaft eines der wichtigsten deutschen Kreditinstitute im 19. und frühen 20. Jahrhundert. Hansemann war einer der bekanntesten liberalen Politiker in der preußischen Rheinprovinz. Hansemann, der sich sonst fast immer für privatwirtschaftliche Lösungen aussprach, befürwortete den staatlichen Bau von Eisenbahnen, da ihr indirekter volkswirtschaftlicher Nutzen enorm sei. The Riot in Broad Street on the Seventh of June 1780. 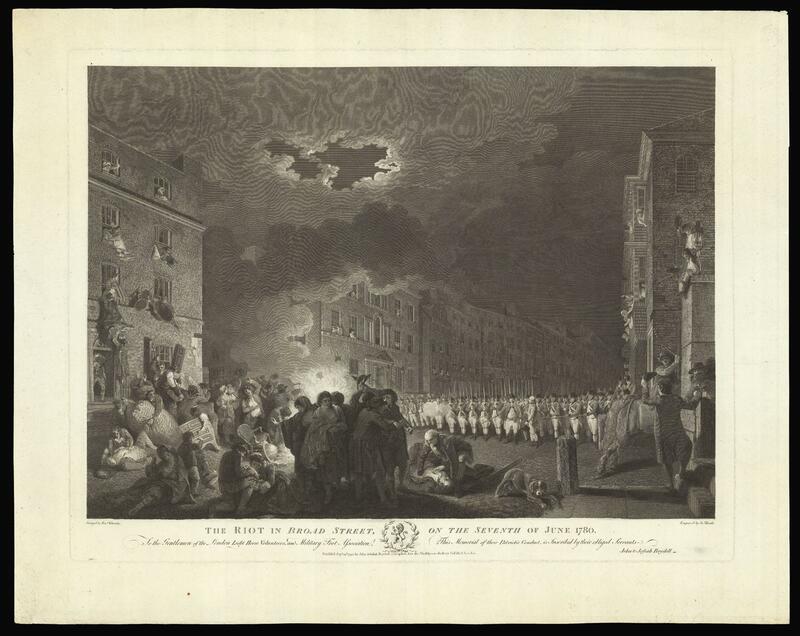 Publish'd by John & Josiah Boydell, Cheapside & at the Shakspeare Gallery Pall Mall, Sept 29, 1790., London, - The Gordon Riots Engraved print. The Gordon Riots broke out across London in June 1780 in protest at the Papists Act, passed two years before. The Papists Act had lifted a number of the Penal Laws in Britain, which discriminated against Roman Catholics. The Protestant Association in London, led by Lord George Gordon, marched on Parliament along with other protesters to present a petition against the Act. The disturbance spread, resulting in the destruction of Newgate Prison and the Clink, and the escape of the prisoners. After several days, troops were sent against the rioters.The print was made after a painting by Francis Wheatley, commissioned by the publisher John Boydell. It shows a specific incident during the Riots, when the house of a rich Catholic Irishman, Mr Donovan, was attacked and looted. Troops arrived and fired on civilians after giving them several orders to disperse. The painting was destroyed while the engraving was being made from it, but the print was widely circulated. It is dedicated to the London Light Horse Volunteers, who helped during the riots, and was possibly commissioned to show the inadequacy of the authorities' response.James Heath (1757-1834) engraver, he was appointed historical engraver to George III in 1794.Francis Wheatley (1747-1801) painter; he was elected to the Royal Academy in 1791. Image: 425 by 597mm (16.75 by 23.5 inches). Sheet: 580 by 740mm (22.75 by 29.25 inches). BL G,8.152; BM G,8.152; John Heath, The Heath Family Engravers 1779-1878, vol 1. (Aldershot: Scolar Press, 1993) 1790.6; Mary Webster, Francis Wheatley (London: Routledge and Kegan Paul, 1970) E69. 1790. Torino 1790 e Torino 1791 stampate in Carmagnola, presso Pietro Barbie 2 volumi in 8° Pagine 271 + 256 Legatura inizi '900 in cartone occhio di pavone. Dorsi mancanti. Ottimo esemplare in barbe di questa rara opera in edizione originale dedicata a una precisa descrizione delle ville e delle cascine torinesi, molte delle quali ancor oggi esistenti, e ripartite rigorosamente in ordine alfabetico, con relativi nomi dei proprietari e indirizzi delle residenze invernali. Manca, purtroppo, la carta corografica. Sull'opera: Peyrot, Torino nei Secoli, I, 232. Lozzi, II, 5394. WOLFE, James (1726 - 1759)., "The death of General Wolfe". 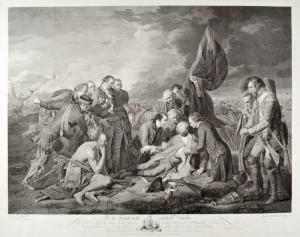 Der Tod des englischen Generals in der Schlacht von Quebec 1759. Ganzfigur nach halblinks in Uniform, sterbend inmitten der siegreichen Truppen. Links im Vordergrund sitzend ein tätowierter Indianer, er blickt nachdenklich auf den Sterbenden. 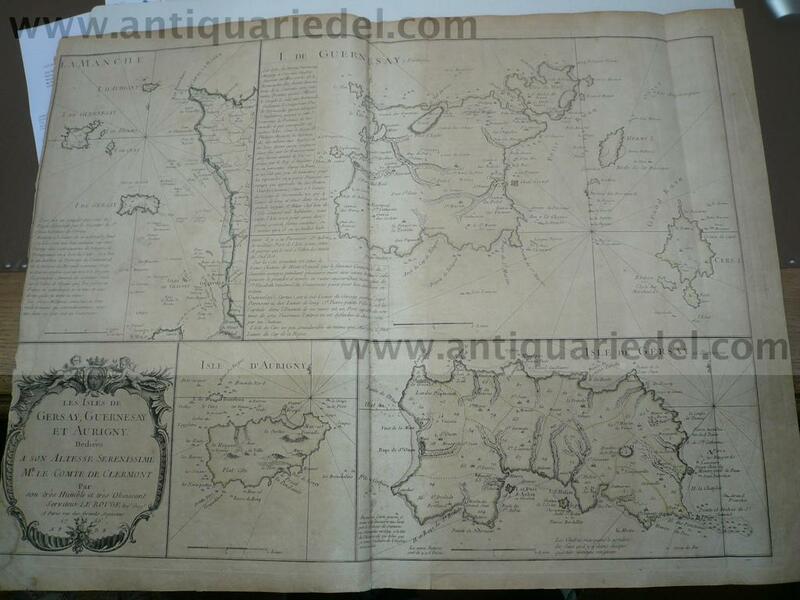 Artist: Dezauche/de l Isle JA / G; issued in: Paris; date: 1790 - - technic: Copper print; colorit: colored; condition: Very good; size in cm : 45 x 65 - description: Map of Greece and the Aegaen Sea - Vita of the artist: J. A. Dezauche was the successor to Guillaume De L'Isle and Philipe Buache.